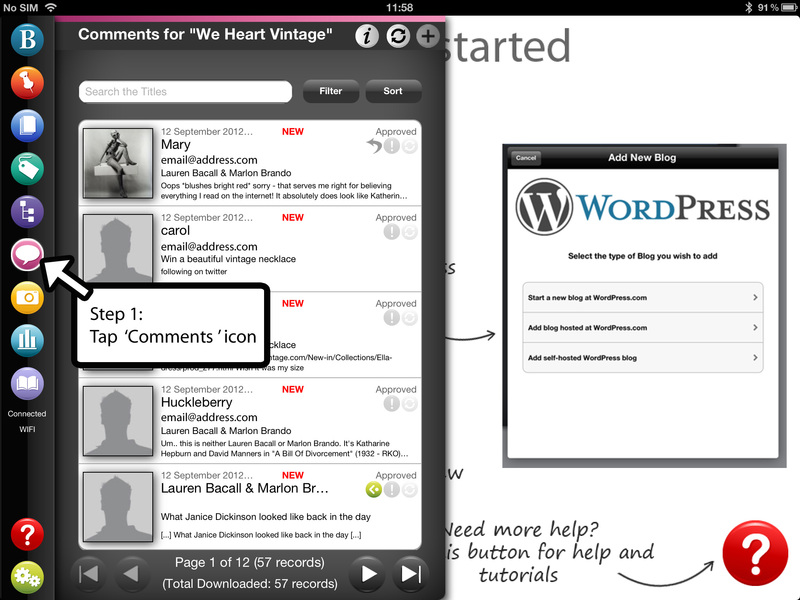 How to manage comments, pingbacks and trackbacks on your WordPress.com or WordPress.org blog with BlogPad Pro for iPad. To get the latest comments tap the ‘Refresh’ icon. 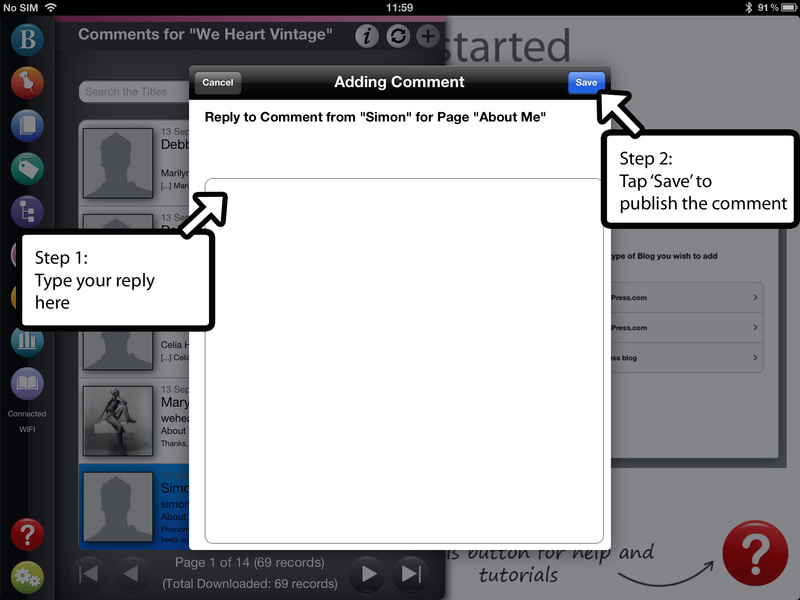 You can choose the number of most recent comments to retrieve, then tap ‘Get Comments’. You now have got an up to date list of comments. If you want to change the status of a post, edit, delete or reply to a comment tap on it to launch the ‘Comment Options’ menu and select your option. When you go into your blog comments you will see approved comments in white and unapproved / pending comments in yellow. 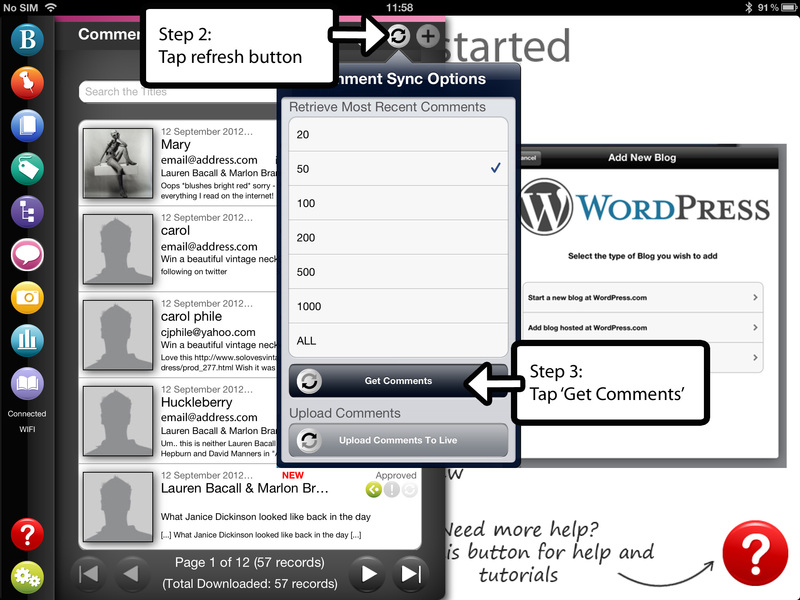 To quickly manage your unapproved comments, click on the comment and in the menu choose either approve or mark as spam. To see the comment in more detail or to make changes you can select Edit. 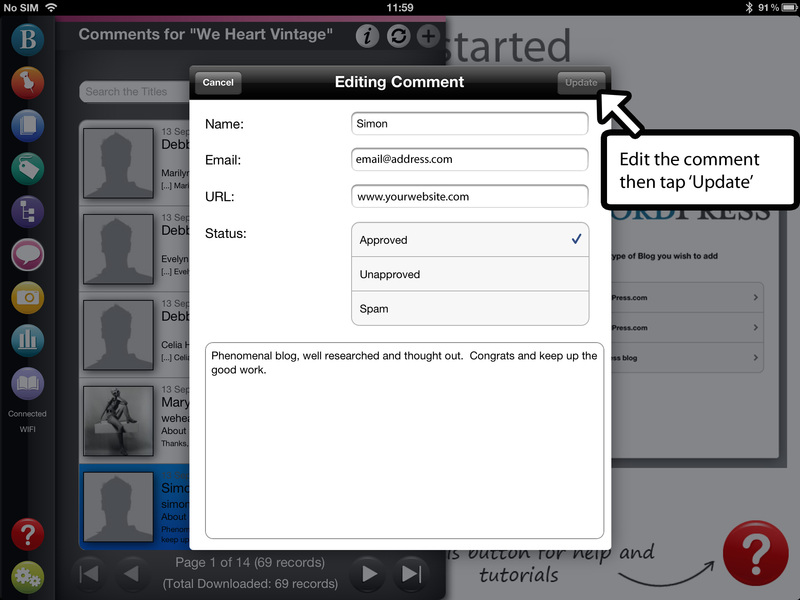 When you select edit, you can change the name, email, web address and content of the comment as well as it’s status. When you have finished editing you can select Update to save and close the editing screen, or Cancel to exit without saving. To reply to a comment, tap on the comment and select ‘Reply to’. Type your reply in the text box and tap ‘Save’ to publish your reply. 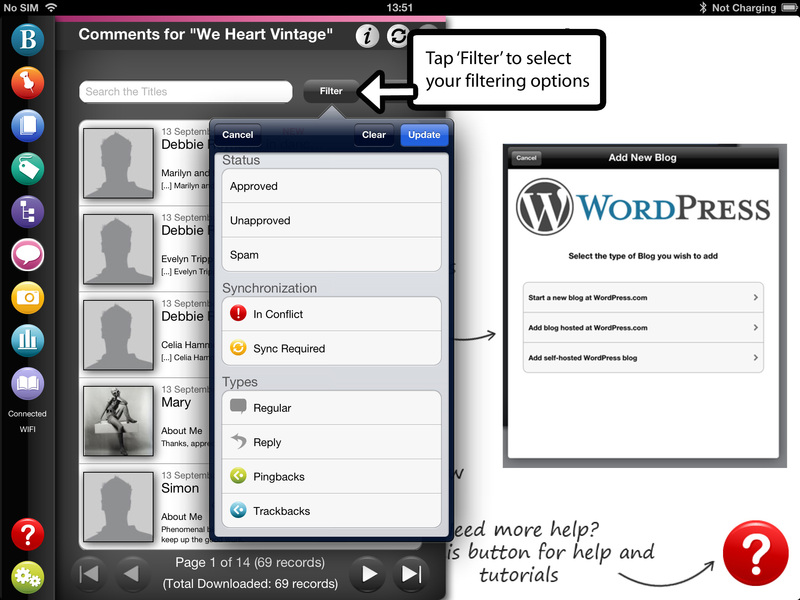 Filtering: this helps you view comments by status. 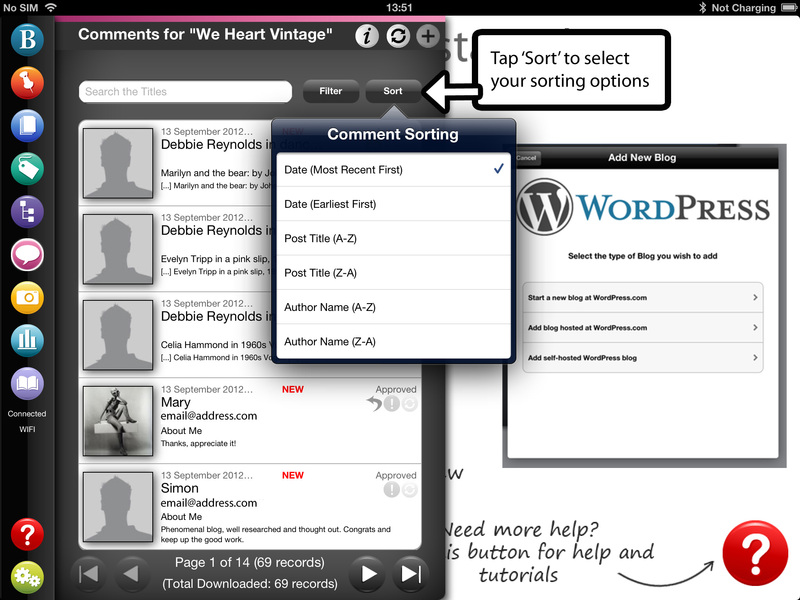 You can select approved, unapproved or spam comments (or a combination of any of these). By default your comments screen shows your most recent approved and unapproved comments. You can sort your comments by date (most recent/latest or earliest), alphabetically by post title (either A-Z or Z-A) or by author name (again either A-Z or Z-A). What is the difference between mark as spam and delete? Mark as spam moves a comment into the spam folder, which you can access by clicking on Filter and selecting Spam. When you delete a post it is deleted permanently and you will not be able to retrieve. The Delete option should be used with caution.